The water is obscured by a thick mist today. I woke to the sound of rain, drumming against the windows. All day it alternated between a heavy downpour and a steady, gray drizzle. I took a run in the morning—out to the beach where you can stand at the top of the steep staircase that leads down to the water. I stretch my stiff legs there and watch the water slowly ebb and flow. It's oddly calm given the stormy weather, but you can only see a little ways out past the shore before the rain and mist blur the horizon into a smudge of soft blue-gray. I run home, ending up at the center of town. The air outside of the coffee shop (tiny, run by a reticent yet colorful Italian man named Aldo with wild curly white hair) smells of roasting beans, and it lures me inside. Hot coffee, lightened with a splash of foamy almond milk, warms my hands as I walk the few blocks home. I stop in the bookshop to see if they have gotten Jojo Moyes' new novel yet (not til Tuesday! ), then briefly into the hippie health food market to pick up a breakfast cup (which is what they call a mini quiche-like dish of eggs and vegetables encased in puff pastry). At home, a hot shower. Warm clothes. More coffee. The fireplace crackles and spits as the logs (wet from the winter air) start to catch. I love the quiet of this street. It's close to the center of town—in just mere seconds I could be in a cozy, bright restaurant or buying vintage furniture or standing on the town pier. But the house feels tucked away, as if it's miles from anywhere, no people in sight. Since yesterday was surprisingly warm (okay, high of 50 degrees, but still), we grilled outside. It was one of those "throw it all together" meals: pork sausages spiced with caraway seeds and mustard from a local farm, bell peppers, romaine, and portobello mushrooms. Everything gets tossed together, once grilled and charred, in a big bowl with olive oil and salt and pepper. Tonight is a pizza night, as are most Sundays. The go-to order is a white pie with mozzarella, herbed ricotta, crisp bacon, roasted mushrooms, and lots of fresh basil. For dessert, I scrounge about for what's left in the kitchen, hoping to finish up the odds and ends before the week begins and we head back to the city. A few leftover burnt sugar and fennel shortbread cookies plus the last slice of cake is more than acceptable. I pair all this with Prosecco, a new one recommended by the very adorable man at the wine shop who was eating a chicken salad and clearly thrilled to have a receptive audience to whom he could wax poetic about grape varietals and off/on years for sparkling wines (I nodded enthusiastically and grabbed the one with the most fun-looking label, TYPICAL). And you guys, this cake. I found the recipe in the archives of a British food magazine and I cannot articulate how much I love it. 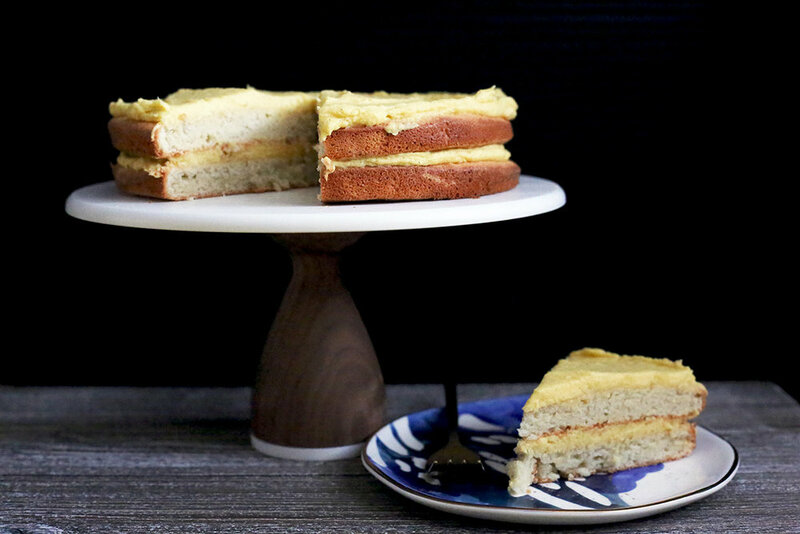 It's moist and chewy and tastes precisely like what you'd imagine if a classic yellow sponge cake got together with a chewy almond macaron and had wild, passionate, baked good love. But that's not even the best part. The best part is the frosting! It's very unusual in technique: You make a simple vanilla custard on the stovetop, then you chill the custard. Once chilled, you beat the custard with softened butter and a pinch of salt until it gets light and fluffy and buttercream-esque, but far more flavorful and less sweet. I shall say nothing more than try it, I promise you, trust me, cake is so good, this cake is exceptional, I love Swedish things, including Swedish fish, I sort of want to go to Sweden and eat all cardamom-flavored things....okay. Well. That was actually a lot of things to say. But make it. Tell me about it. You will fall in love (with the cake, that is. If you fall in love with something or someone else too in the process, so much the better!). **Note: As this is a Swedish recipe, I've given all the ingredients in weight. I realize that you might want them in volume! But they don't translate perfectly and I'd much rather you make it as written. If you don't have a kitchen scale, I IMPLORE you to go get one and use it. Not only is it so, so much easier and quicker and tidier to use a scale than to measure by volume, but it ensures much more accuracy when baking. First, make the custard for the frosting (it needs to cool fully): Whisk together the cream and sugar in a heavy-bottomed saucepan and cook over medium-low heat until just barely simmering. In a large heatproof bowl, whisk together the egg yolks, cornstarch, and vanilla extract. Slowly pour the hot cream mixture into the egg yolk mixture, whisking constantly so as to not cook the eggs. Once combined, transfer the custard back into the pot and cook over medium-low heat (whisking constantly) until the mixture thickens and coats the back of a spoon. This will take about 5 minutes, or more depending on the heat level. Once thickened, transfer the custard back to the heatproof bowl, place a piece of plastic wrap over the surface (so a skin doesn't form), and let cool fully in the fridge. While the custard cools, make the cake. Preheat the oven to 350℉ and grease and flour (or line with parchment) two 8" round cake pans. In a clean bowl of a stand mixer with the whisk attachment, beat the egg whites until stiff. Scatter half of the sugar over the egg whites and whisk to combine. Whisk in half of the almond flour (the mixture will deflate slightly at this point; that's fine). Using a spatula, fold in the remaining sugar, almond flour, almond extract, and all-purpose flour. Divide the batter between the prepared pans and bake for 25 minutes. Remove from the oven and let cool for 10 minutes before turning out onto a wire rack to cool completely before frosting. Finish the frosting by beating the softened butter until very light and fluffy. Slowly add the cooled custard with a pinch of salt and beat until spreadable. If it seems too soft, chill in the fridge for 20 minutes then try beating it again. To assemble the cake, spread a layer of frosting over the first cake layer, top with the second cake layer, then frost the tops and sides.